R. Ferri Motorsports’ Toni Vilander and Miguel Molina took the race No. 2 win during the main event at COTA. With frigid temperature drops and light rain misting, both K-PAX Racing and R. Ferri Motorsports had their cars cross the finish lines to claim the top podium spots on Saturday and Sunday, respectively. With K-PAX’s new generation of Bentley Continental GT3 cars (No. 9 and 3), driver pairs Andy Soucek and Alvaro Parente, along with Rodrigo Baptista and Max Soulet led the charge on Saturday’s season opener with the fastest lap of 2:06.037 for the No. 3 car on the seventh lap. Still, the Bentley duo could not match the nimble No. 61 Ferrari 488 GT3 on the second day of racing. No. 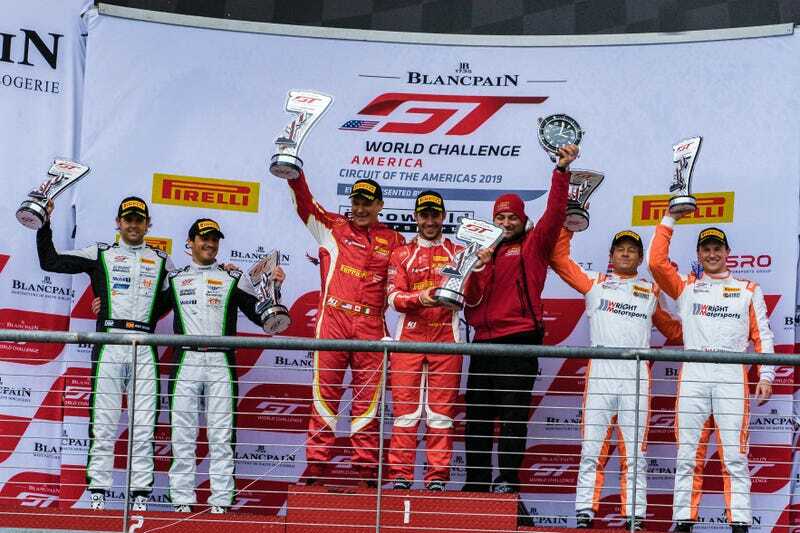 61 R. Ferri Motorsports’ Ferrari 488 GT3 won the second day of GT Racing. Interestingly enough, the 488 set the fastest lap time of 2:03.488 on its third lap of the race and was nearly a full second quicker than the No. 9 Bentley right behind it. On both occasions, Patrick Long and Scott Hargrove carried up the podium in third place wins with their No. 58 Porsche 911 GT3 from Wright Motorsports. The No. 47 car, driven by Jason Hart and Matt Travis, took the trophy both race days for GT4 Pro-Am. For GT SprintX, the No. 47 Porsche 718 Cayman CS MR, Matt Travis and Jason Hart took home victories on both days for NOLASPORT in the Pro-Am category, with the fastest lap set at 2:18.167 on the second race under lap 11. For GT America East, Park Place Motorsports’ No. 77 718 Cayman also took the trophy twice for the EPro-Am category, driven by Alan Brynjolfsson and Trent Hindman. They set their fastest lap at a 2:18.002. No. 77 driven by Alan Brynjolfsson and Trent Hindman took the trophy both days for the EPro-Am category in GT4. Rearden Racing’s Vesko Koarov and Jeff Burton sinched the win on day one for GT4's America West in the WAm category, with their best time on lap three at 2:18.560 in their Audi R8 LMS GT4. But on day two, ST Racing pulled both first and last place, with first going to their No. 28 BMW M4 GT4 driven by Jon Miller and Harry Gottsacker. They managed just a second slower at 2:19.771 and did not set a fastest lap during their race. No. 28, Jon Miller, Harry Gotsacker in their BMW M4 GT4 for ST Racing. Johan Schwartz and Jeff Ricca, driving for Rooster Hall Racing and GenRacer respectively, swapped places on the podium between race days. Schwartz, in his No. 80 BMW M235iR Cup, just barely grabbed the checkered flag on day one with half a second in front of No. 26 Toby Grahovec racing for Classic BMW. Ricca placed third. Jeff Rica (78) and Toby Grahovec (26) were always on each other’s bumper throughout the weekend. Grahovec yielded to second place both races, with Ricca at third on the first day and coming in on top on the second day. But as Schwartz, Grahovec and Ricca continued their battle into day two, Ricca came out on top with his win in his No. 78 Hyundai Genesis Coupe even being two seconds behind the fastest lap set that day. Grahovec came in second yet again, but this time only behind by a third of a second in his BMW M240iR Cup. In a similar position-swapping fashion, TFB’s Mason Filippi in his No. 12 Hyundai Veloster N TCR came in first on Saturday with his fastest lap of 2:21.070 set at lap five and similar pace set for his first place win on Sunday. Yet second and third places swapped; Michael Hurczyn (71) in his VW Golf GTI TCR came in second on Saturday, third on Sunday, with Euro’s Nate Vincent (72) trading places. However, with both drivers under FCP Euro, the teammates couldn’t be happier they both got to grab the checkered flag for a day. Michael Hurczyn (71) in his VW Golf GTI TCR came in second on Saturday, third on Sunday for FCP Euro. Nick Wittmer managed to come out on top both days for TCA with his TechSport Racing Subaru BRZ tS (No. 91). He also set the fastest lap times for TCA on both days, with 2:33.836 on the second day during lap 13. GT3 won’t be running again until April 26th at VIRginia International Raceway. Meanwhile, GT4 and TCF are set for this coming weekend, March 8th, in St. Petersburg, Florida for a street course.